Smartphones have become an integral part of our daily life. But when they slow down or start giving issues, we like to switch to a new one rather than resolving the problem. Most of us aren’t aware of the fact that phones become slow and sluggish as they are cluttered with unwanted data and third party apps that shorten battery life and may even lead to phone crash. If we clean our phone once in a while we can solve this issue and give our phone a long life. So, what are you waiting for follow these tips below to declutter your phone for its long-life. Apps take up a lot of space on your phone. Therefore, the first thing you need to do is to arrange the apps and see if you have any app that you haven’t used in over a month. If there is any then deleting it is the best option. Why? The answer is, if you haven’t used them in a month then in all probability you may not use them often. And if you think you may need the app later then you can install them when needed. This way you will be able to declutter your phone and manage the data. A general rule to stay safe is to keep your data backed up. This will not only make you tension free but also help you to free up space on your phone and speed it up. Imagine if your phone gets infected then what? You will lose all the data if you don’t have a backup. Therefore, data backup is the safest bet to stay on top of cyber criminals. 3.How Many Contacts in Your Phone? Ever got time to check your contact book? No, then it’s time you check it. You will be shocked to see the number of duplicate contacts you have in your phone book. By now you must be wondering where they came from? As you keep changing your phone, you have a habit to import all your contacts, without checking them, due to which you end up importing and saving duplicate contacts, thus making it redundant. All this data occupies space on our phone and makes it sluggish. Therefore, to keep your phone working you need to keep a watch on your contact list and keep on deleting duplicate and redundant contacts. Must Read : How Safe Is Your Android Phone For A Digital Transaction? Gone are those days when we used to download and save music on our phone. Now with Wi-Fi, 3G, 4G connections and music streaming apps you can listen to your favorite music without storing it on your device. When you can listen to your favorite music anytime then why occupy unnecessary space. Same is with text message, whatsApp, videos, GIF and other data. With backup service available in most phones there is no longer a need to store any such data on device. You can remove all the unnecessary data and save valuable space on your phone. Plus, disable location when not in use. Because apps like maps, ride sharing services, and others use geolocation too and they run in the background thus making your phone slow. Therefore you should disable it when not in use. Changing passwords once each month is a good practice it keeps device safe from cyber attacks. You should create a password of minimum length of 8 characters, combination of upper and lower case, symbols and numbers. This makes it difficult for the attackers to access your information by cracking the password. Furthermore, never use same password for different accounts, always use different passwords for all accounts. Keeping your phone software updated is a good practice. It helps to secure your phone and fix security loopholes that make your phone vulnerable to attacks. Ignoring security updates is a wrong habit as you give an open access to cyber criminals if you do so. 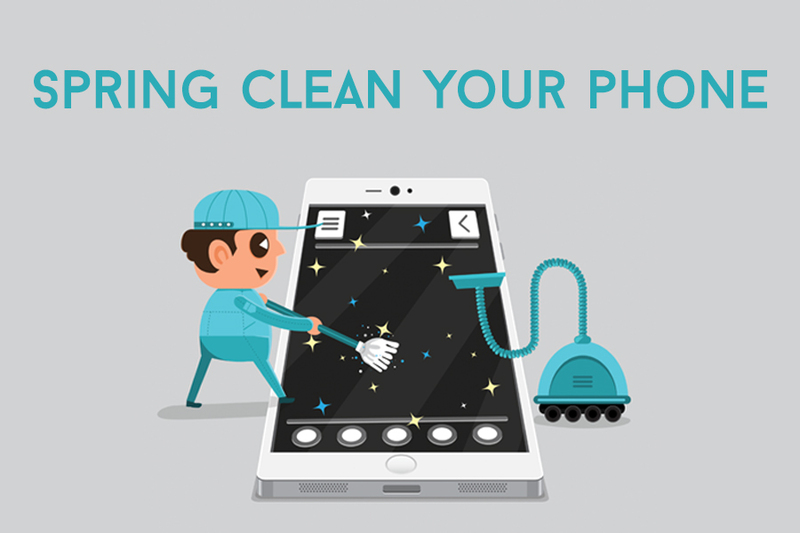 If you think that by cleaning phone from inside the job is done then it’s a big misconception. It’s only half battle won to clean it completely you need to keep it clean from outside too. For this remove your phone cover (if any) now take a clean cloth and wipe your phone. Avoid using wet wipes or alcohol solution it may damage your phone. Safety always come first, to ensure that your phone is protected from online threats install and run a reliable security suite. Avoid running more than one antivirus application as it makes your phone slow and makes it more vulnerable to attacks. Hope you will keep the above mentioned steps in mind to maintain your phones and keep it guarded from cyber attacks. If you follow these tips your phone will have long battery life and you won’t feel the need to change it often. Must Read : Hackers Who Stole 1.2 Billion Euros Finally Arrested! We hope you like the article please share your feedback with us.